Low Mileage, Sunroof, Leather Seats, Heated Seats, Bluetooth, SiriusXM! On Sale! Save $900 on this one, we've marked it down from $14888. 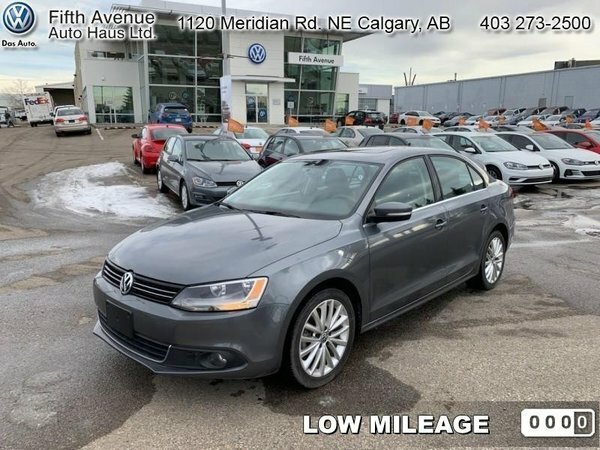 This 2012 Volkswagen Jetta is for sale today in Calgary. This low mileage sedan has just 56567 kms. It's platinum gray metallic in colour. It has an automatic transmission and is powered by a 2.0L I4 16V DDI DOHC Turbo Diesel engine. This vehicle has been upgraded with the following features: Sunroof, Leather Seats, Heated Seats, Bluetooth, Siriusxm, Aluminum Wheels, Air Conditioning. It may have some remaining factory warranty, please check with dealer for details. Buy this vehicle now for the lowest bi-weekly payment of $165.10 with $0 down for 48 months @ 7.24% APR O.A.C. ( Plus applicable taxes - Payment includes $574 documentation fee and 6.25 Amvic fee. / Total cost of borrowing $3182 ). See dealer for details.